Run Geordie Run fundraiser Mark Allison returned to a hero’s welcome - but said he was just looking forward to a bit of cold weather. 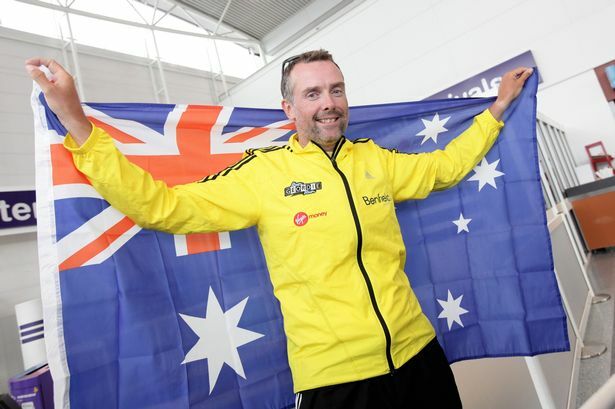 After 82 days and almost 2,500 scorching miles, the multi-marathon man jetted back into a drizzly eight degrees Celsius at Newcastle International Airport. And he was applauded and cheered as he was reunited with supporters who have helped him raise almost £50,000 for The Sir Bobby Robson Foundation and The Children’s Foundation. Ten days ago Mark did call off his challenge just 200 miles from the end, citing safety fears, but 12 hours later changed his mind and worked out a new safer route, finishing in the waves of Shellharbour on Australia’s east coast - a finish line he reached just seven hours before he was due to board a flight home. “I’m not a quitter and I’m so relieved that I didn’t,” he said. Mark is now looking forward to returning to normal life, with a second Christmas with his son Jack and trying to regain the feeling in 80% of his blistered and swollen feet. “It’s back to work on Wednesday and I think we’re going to have a second Christmas with Jack,” he said. “Though it’s a good job I have Tuesday off, as I’ll need to buy presents - not of course that Santa doesn’t bring them all. Mark said he hoped his parents, who both lost their lives to cancer, would be proud of the more that £200,000 he has raised over the past 20 years, and that his fundraising efforts can continue - once his injuries have healed. “This journey will be something to tell my grandchildren as so many things went on - but I’ll write it all down in book form and hopefully I’ll get interest from a publisher, and raise more money in aid of the two charities,” he said. Even after his epic run ended, there were still twists and turns to Mark’s journey, with a broken down hire car meaning a frantic rush to the airport in Sydney, and his luggage - including his house keys - failing to board his connecting flight in Dubai. But to apologise about his missing case Emirates chauffeured him home. Personal trainer David Fairlamb said he was just pleased to see Mark back and safe. “I’m pleased he’s back in one piece and that he’s ‘undefeated’ – as at one point we didn’t know if he would finish,” he said. “I’m blown away by what he’s achieved,” Shearer said. Peregrine Solly, chief executive of The Children’s Foundation was equally pleased to see Mark return, and said he hoped the money raised for his charity might be used for a number of projects, including possibly expanding the “clown doctors” scheme at the Great North Children’s Hospital.